I first posted this recipe back in 2008. If you’d like to see the original post (and some awfully cute pictures of my kids when they were little) click here. 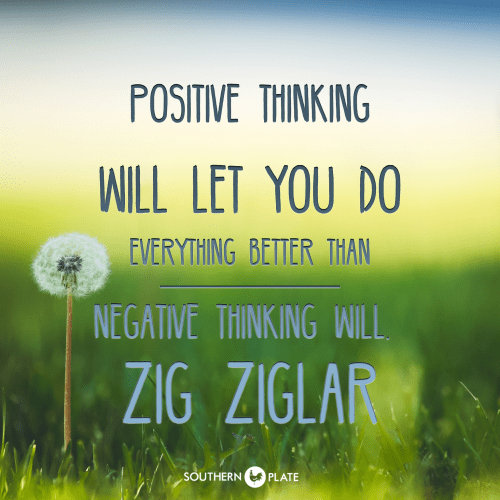 Good afternoon Southern Plate Friends! 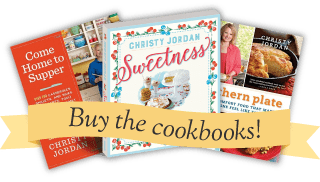 I am writing this from the passenger seat of my car as we careen down the interstate towards Branson, Missouri.As I head out, I wanted to share with you a recipe that is loved by everyone who tries it. 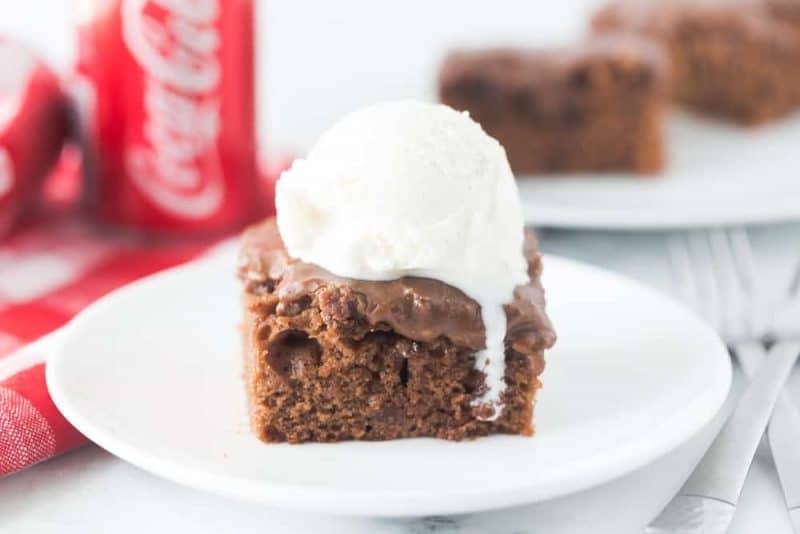 This Coca Cola Cake is ultra moist, rich, and fudgey. It’s also pretty easy to make – don’t let the length of the recipe fool ya! As always, the complete recipe is in printable format at the end of this post. 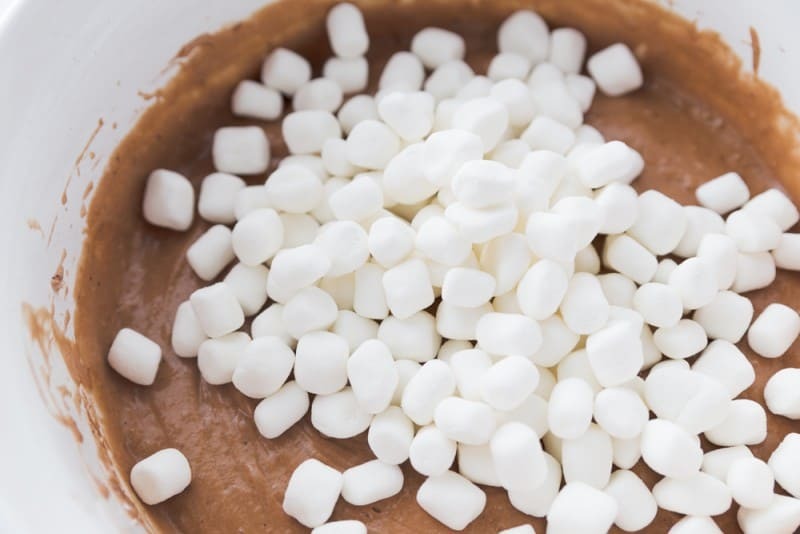 To make this, you’ll need: White Cake Mix, Cocoa Powder, Butter, Coca Cola, Buttermilk, Eggs, Vanilla, Miniature Marshmallows, Confectioner’s Sugar, and Pecans (if you like). Preheat oven to 350 degrees. Lightly mist a 13×9-inch baking pan with vegetable oil spray. Set the pan aside. 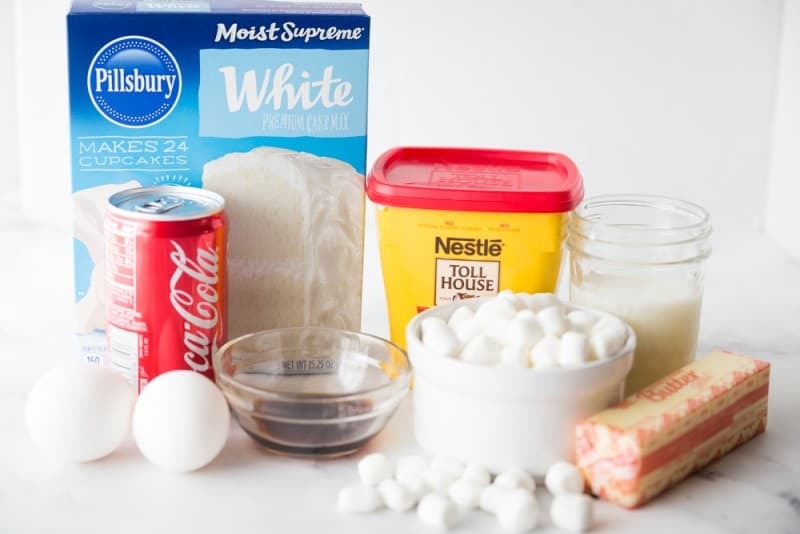 Place the cake mix, cocoa powder, melted butter, Coca Cola, buttermilk, eggs, and vanilla in a large mixing bowl. Blend with an electric mixer on low speed for 1 minute. Scrape down the sides with a spatula. Increase the mixer speed to medium and beat 2 minutes. The batter should be well blended. Fold in the marshmallows. Pour the batter into the prepared pan. Bake the cake until it springs back when lightly pressed with your finger and just starts to pull away from the sides of the pan, 40 to 42 minutes. Remove the pan from the oven, prepare frosting while cake is still hot. Place the butter in a medium saucepan over low heat. As the butter melts, stir in the cocoa powder and Coca Cola. Let the mixture come to just a boil, stirring constantly, and then remove it from the heat. Stir in the confectioners’ sugar until the frosting is thick and smooth. Fold in the pecans, if using. Pour the frosting over the top of the cake, spreading it out with a rubber spatula so that it reaches the edges of the cake. Cool the cake for 20 minutes before serving. Oh. My. Goodness. I’m about to lick my computer screen just thinking about this cake again. (insert your name here) has been assigned the task of making a Coca Cola Cake. This assignment is due within ___ days and will be graded. Please support him/her by volunteering to taste said cake and offering your affirmation of appreciation immediately forthwith. 1 cup chopped pecans I left these out because my kids prefer this cake with no nuts, but pecans are GREAT in this! Preheat oven to 350 degrees. Lightly mist a 13x9-inch baking pan with vegetable oil spray. Set the pan aside. 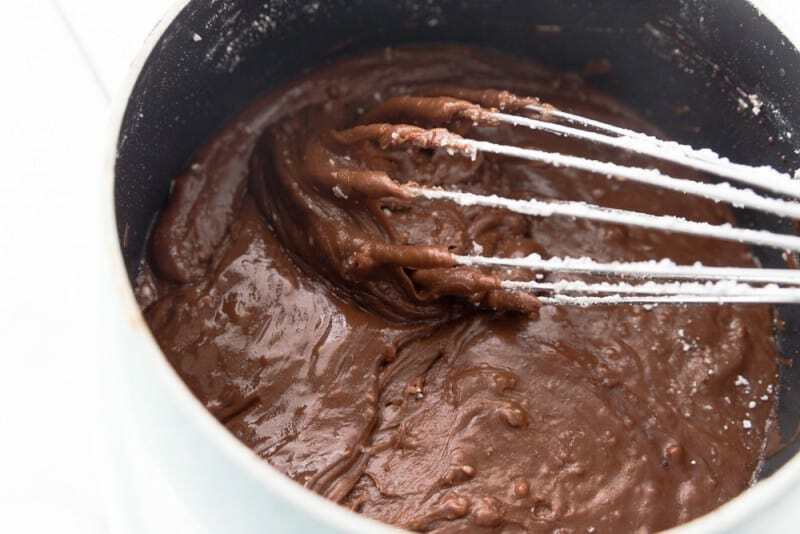 Place the cake mix, cocoa powder, melted butter, cola, buttermilk, eggs, and vanilla in a large mixing bowl. Blend with an electric mixer on low speed for 1 minute. Scrape down the sides with a spatula. Increase the mixer speed to medium and beat 2 minutes. The batter should be well blended. Fold in the marshmallows. Pour the batter into the prepared pan. Place the butter in a medium saucepan over low heat. As the butter melts, stir in the cocoa powder and cola. Let the mixture come to just a boil, stirring constantly, and then remove it from the heat. Stir in the confectioners’ sugar until the frosting is thick and smooth. Fold in the pecans. OH WOW!! That looks amazing!! I’ve always wondered about this cake, I’ve never had it before. I know what I’m making for dessert this weekend!! Thanks!! I just know that you and your Mom are having a wonderful time!! I wish that I could be there. I already have the conference at Lake Junaluska on my 2018 calendar!! I can not wait. I have never seen your recipe for coca cola cake. This looks so, so good! I cannot wait to make it!! Tell your beautiful, sweet Mama that I said hello and send my love to both of you! Can I use Diet Coke in this recipe? Thank you. This cake looks delicious but I need a clarification. Do you spread the frosting on the cake while it’s still a bit warm? Hot? You state to make the frosting while the cake is still hot and then to cool it for 20 mins before serving. Carolyn, Put the icing on the cake while it is still warm/hot and then let the iced cake cool 20 minutes before serving. Hope this answers your question. My daughter made this cake last year for our Annual Cake and Pie Auction for the George Jenkins High School FFA Alumni. It was a hit! In fact, she made a second one for a friend’s birthday! This is one of my favorite cakes! I am so glad she likes it and make sure to tell her thank you for me!!! 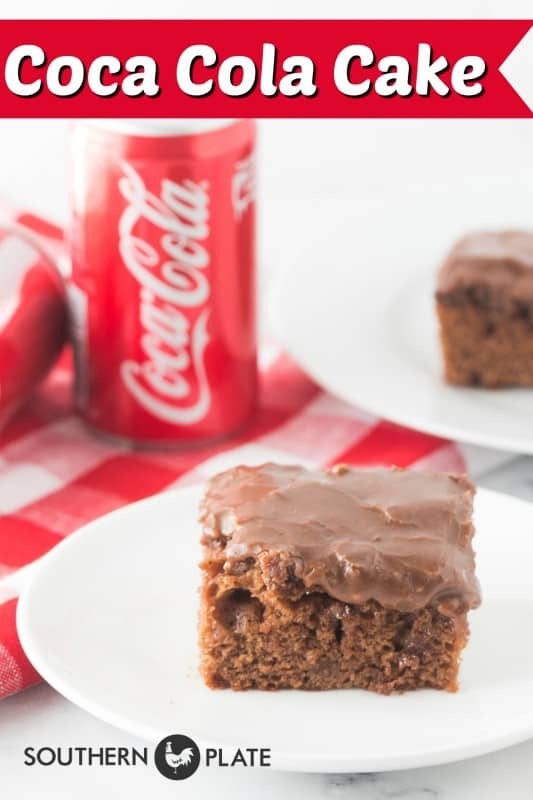 I have made a coca cola cake before but never with the marshmallows. Besides adding a ton of sugar, :), what do they do for the cake? Is it for texture, taste, or what? Just curious. I do plan on trying your version! Marshmallows melt in the cake making it more moist. Thank you Julie, I hope you get the chance to try it soon!! THAT LOOKS EXACTLY LIKE MY TEXAS SHEET CAKE AND ICING. I’LL DEFINITELY TRY THIS ONE TOO. I hope you enjoy it Sandy!! Could I use a chocolate cake mix and leave out the cocoa? I’ve never tried that but it seems like it would be a neat thing to experiment with! I left Branson on Sunday morning early and walked into my house at 11:30 am. I immediately started making this cake and walked out of my house to take over to a family get together at 1:30! Easiest cake ever to make and absolute delicious! It was a huge hit! Moist and super rich! Your recipes never fail to deliver! I was super happy that it started off with a cake mix!!! And super happy I listened to your encouragement to make this cake!! Yes, yes, yes to Coke in cakes! Love it. Used a devil’s food cake mix plus added the cocoa and Pepsi. Made 2- 9″ sq. pans but added pecans & coconut in one pan. All was gone in a day. We loved both. 🙂 I hope you get the chance to rectify that soon!! Can you use Pepsi would it turn out the same?? Can this cake be made in 2-8″ round pans? Also, should the leftovers be refrigerated? Yum! Made this today. Easy and really good. I used a devils food mix but still added the cocoa. Other than that, made exactly as written. Taste test was excellent. Hope guests tonite enjoy as I did. I think next time I will fold in mini choco chips too, cuz what not? Can i use diet coke for this recipe?